Once again I’m tired after a long day and psyching myself up about something super exciting. Which I don’t wanna jump the gun with by sharing about it yet, but rest assured, I’ll share when the time is right. Something I stumbled across today, via ModCloth’s blog, was a totally neato site that made my word-loving heart swell with joy. 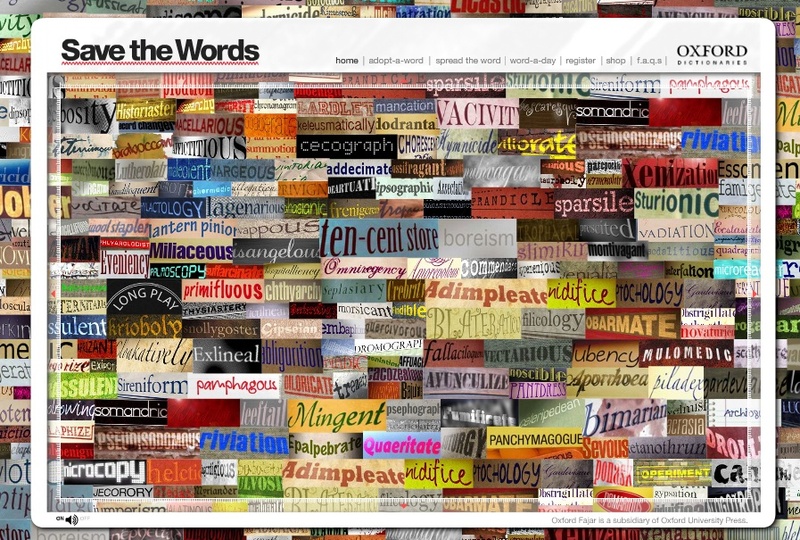 It’s a site called SaveTheWords.org and it’s trying to promote the use of words that are not so popular any more. You can pick your own word of many! In light of recent articles discussing how kids are doing poorly in English and school because of terrible spelling and vocabulary brought on by a crippling T9 dependency, I love this initiative. It’s from Oxford, so obviously it’s advertising and not just jargon philanthropy. But hey! If there’s anything I love it’s a good marketing campaign, especially one so clearly aimed at logophile like moi. Obviously, you’re just dying to know what words I adopted. Drum roll pleeeeeeeeeeeeeease! They even send you a nifty little adoption certificate. Eeee! Adorably enough, the site’s motif includes those little squiggle lines you see when a word is misspelled. These rarely used words have gone so far out of use that they receive the little red squiggles, so it’s a nice little tie in to an iconic image. And now to leave you with my two words in two sentences. Louie had made himself the out to be quite the foppotee in cooking class after he tried to boil a liquid in a covered pot. Had he checked the vacivity of the pot before turning on the burner, he would have gotten hot water and would not have ended up with a charred part. Ok, kiddies, time to hit the hay! Let me know if you figured out the definitions of the words just by reading the sentences and without looking it up. Not to mention the fact that many children learn erroneous spelling and grammar from children’s fiction. But I won’t go there. Congratulations on your recent adoptions. Twins! They’re beautiful.